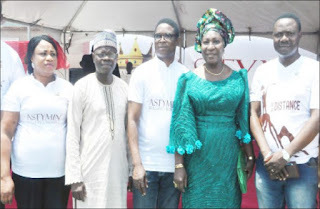 L-R: Astymin School Program Coordinator, Mrs Yetunde Adesola; Mr Olalekan Hakeem of Lagos State Universal Basic Education Board; Representative of Lagos State Deputy Governor, Mrs Folashade Ladiju; Marketing Manager, Fidson Healthcare Plc, Mr. Friday Enaholu and Head, Business and Corporate Development, Mr Oshoke Ayebae, during the 2018 Astymin Brilliance Reward (ABR) presentation at the Ndubuisi Kanu Park, Alausa Ikeja, Lagos. Determined to improve on its annual reward for academic excellence, Fidson Healthcare Plc, under its Astymin Brilliance Reward (ABR) rewarded over 230 public and private schools pupils across the country and awarded scholarship to the three best students in the 2017 West African Examination Council (WAEC). The event, which held at Ndubuisi Kanu Park, Alausa, Ikeja, Lagos, the company’s Marketing Manager, Mr. Friday Enaholo, said was aimed at celebrating and rewarding brilliant kids and ensuring their continuous academic development. 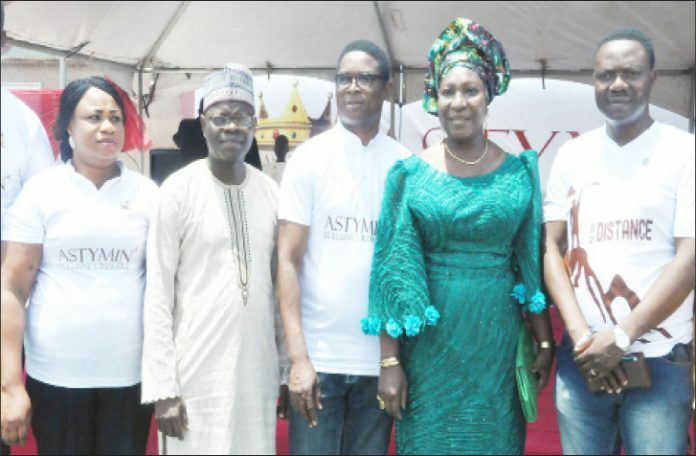 “The Astymin Brilliance Reward is the pharmaceutical company’s yearly event that rewards brilliant final year pupils in primary school, as they transit to secondary schools. This is an indication of the company’s unrelenting commitment to supporting Nigerian children in all their academic endeavours. “This is in line with the corporate brand promise of adding value to the lives of Nigerians as expressed in its slogan: We value life. “Like we have always emphasised, the ABR is our attempt to bring back the glory days of our education by throwing our weight behind the children’s drive for academic excellence. This is another season of delight for the kids who have worked so hard and performed exceptionally well in their academics,” he said. Lagos State Deputy Governor Dr. Idiat Adebule, represented by Mrs. Folashade Lediju, commended the company for the gesture, adding that the state is happy to partner with the company. Adebule said, “It is a laudable programme and highly commendable because they are actually partnering with the government to invest in the future of our children and by extension the future of this great nation. Because they are actually in Lagos, I am sure the partnership will be much greater. “There is a lot that government has put into education because we all know that education is the bedrock of development in any society and the future of our children and is very important. “What they doing today is investing in the education of our leaders of tomorrow. The state government is very happy about that. Education development is cannot be left for the government alone. As at yesterday, the governor approved that we should recruit 2200 teachers for both primary and secondary schools. “I just want to commend Fidson for the huge resources they have been plugging into the development of education and our leaders of tomorrow,” she added. Commenting on nutrition and development of children, the Deputy Governor advocated for balanced diets and food supplement. Citing the popular axiom, Adebule said, health is wealth and a healthy nation is a wealthy nation, stressing, that summarises the fact that we cannot leave out nutrition in anything we do. She noted that recent studies recommends good nutrition for everyone to be healthy. Recently nutritionists are saying make your food your medicine, she observed, stressing, “If you are well- fed and eat balance diets; automatically you are bound to be healthy. “And with the Asytmin product that is actually sponsoring the Fidson healthcare brilliant reward, we all know that food supplement is very important, especially for the growing children.